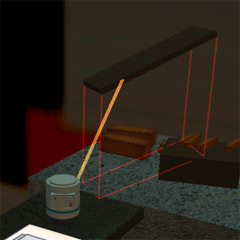 Projecting the silhouette of the object with guides at all the corners is the classic CAD way of doing this, so it *ought* to suffice. The other thing CAD packages do (and lets face it, King Machine does show definite similarities to one) is snap-to-position to make it easy to line up edges. Actually figuring out what to snap to what is a pig, though. Hmm… possibly I should actually have researched some CAD solutions before reinventing the wheel? I already have some snap-like tools (which is part of what I was referring to when talking about scenery), but they're mostly useful for slightly more advanced things so I won't be tuning those for a while yet. Early levels need to be completable without that sort of thing simply because otherwise the players' heads will explode from information overload! Any feedback on some other aspects of the current UI ? Not the more complex aspects, no. This being for the simple reason that the playtest levels so far don't make use of the advanced elements!